The Planets always has a curious effect on me. My first reaction is to groan, ever so slightly, as a result of the Classic FM-style popularity of the work. This popularity is in itself is no bad thing, but the work has become something of an overused cliché, in my mind at least. However, every single time I listen to the work - or indeed play it - I cannot fail to marvel at Holst’s undeniable genius. On many levels, the work owes its popularity to its sheer brilliance, and that is not something to be sniffed at in a ridiculous pseudo-intellectual “let’s keep classical music for the elite” type of argument. Classical music can, with enough of an open mind, appeal in some way to every single member of the human race. After all, it shares a common language – that of emotion. Well-written works such as this deserve to be heard by all, not just those of us with music degrees. It is to be celebrated that Holst created a masterwork with such widespread appeal. Here, Mars is taken at a moderate tempo, giving a good balance between, drama, clarity and restraint. Venus is delicate and magically ethereal, while Mercury’s cheerful character comes across with ease. Jupiter is bright and sparkling, with the famous ‘I vow to thee my country’ section possessing a certain luminescence and lightness which is particularly appealing. Saturn is rich and dark, with the addition of exotic instruments such as the alto flute - notated as ‘bass flute in G’ in the score. This rendition is heavy and tired, and yet hope is retained. Uranus is powerfully rhythmical and eccentric, while Neptune ends the work with peaceful contemplation. This is an excellent recording which possesses a strong feel for the individual characters of the movements and looks upon the work with somewhat fresh eyes. Elder’s sound is rich and warm and remarkably clear. The choir is beautifully haunting, Holst’s magical orchestration performed here par excellence. 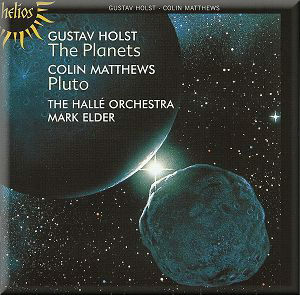 Colin Matthews’ Pluto, first performed in 2000, begins out of the last notes of Neptune, and maintains the character of Holst’s language. It’s a lively scherzo with the underlying dark sounds of Holst resonating under the brightness of the flighty high woodwind and brass flourishes. Matthews has created an interesting addition to Holst’s work, which both complements it and uses it as a starting point for new ideas. Holst’s Lyric Movement for viola and small orchestra was composed for Lionel Tertis in 1933. This one movement work is performed here with conviction and a rhapsodic sense of changing emotions. Timothy Pooley plays with a warm, rich sound which leads us into the world of Holst’s writing with ease.